It is very difficult not to notice when the judge cruises by. 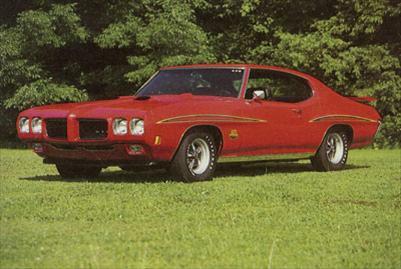 Beginning in 1968 and continuing through through the redesign of 1970, pontiac packed all its performance options for the muscle-bound gto into a flashy package called simply the judge. While the jury may still be out on the name, a strong case can be made for what lies under the hood. Turning heads for 1970, pontiac exposed the front head lamps of its speedy intermediate muscle car and shortened the oval twin-slot grille, but the zippy trimmings remained the same. The judge package included a bright paint job, the judge decals, racing stripes, dual closeable air scoops, a front air dam, a deck-mounted stabilizer wing and an optional hood-mounted tachometer. None of these details actually add to the cars street performance, but at a standstill the judge looks ready to bolt like an angry bail-jumper. backing up the flash giving up some quickness at low rpms, the judge was built to be opened up for high speeds. The ram air iii or the 370hp ram air iv engine could be dropped into either the two- door hardtop or convertible models. Both are now much sought-after collectors items because of their unique flair and rarity. Production of the judge began in december 1968 and ended after the 1971 model year. The judge copped its name from a zany skit on televisions rowen and martins laugh in, a popular comedy show of the time.